Jeff and I recently had the below banner of Milt created to fly outside our front porch. She really has gone crazy - Just joking...! 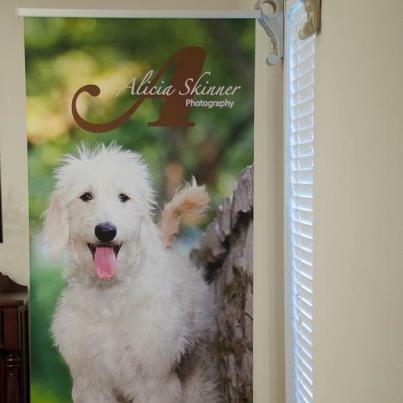 Our good friend, Alicia, had this impressive banner printed to display this past Saturday at the SPCA's annual fundraiser, Strut Your Mutt. Alicia was the official pet/people portrait photographer for the event. Jeff and I participated last year when we were actually dogless, but Milt was picked and due to arrive in June. This year, unfortunately, we did not attend, but it is always a great event complete with a 3K "strut," 5K run, games, and vendors with all sorts of awesome pet products. Anything to raise money for stray cats and dogs is always a good cause. If you have been reading my blog throughout the year, you know that this photograph was taken by Alicia when we were trying to win the Doodle Calendar Contest, which we did with Milton becoming Mr. March! I cannot recommend Alicia highly enough; she is an incredibly talented photographer - patient when taking shots, creative with different poses, and skilled with innovative camera techniques. If you are thinking about any sort of photo shoot (wedding, baby, holiday, puppy birthday!) in the Dallas/Fort Worth area, you should definitely keep her top of mind. As I always say (whenever you get me going on the topic of our wedding...), our wedding photographer was far less than stellar, so I plan to engage Alicia for a proper family portrait as we get closer to the holidays. Now that we are a family of three (Jeff, Milt Dog, and me! ), I need some formal photos to display around the house. When it was just Jeff and me, I felt a little silly displaying multiple pictures of our smiling faces, but now that we have our goldendoodle, Milt, it seems much more natural to showcase our sweet boy! Family portrait! I think your son is old enough for you guys to splurge once a year on family protraits! Thank you for the kind post Heidi! I just loved taking photos of Milton and look forward to taking your family portrait as well. It will be so much fun! Thank you again!